Recently a new product has been added to the portfolio on the VDOCs website, namely a storage folder for board documents. The storage folder for board documents fits perfectly in the vehicle compartment (dashboard / glovebox) and is not tied to a vehicle mark (so no brand logo exists), making it widely applicable! 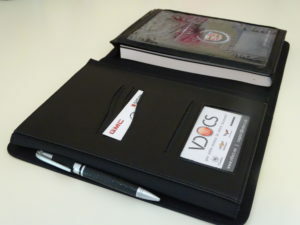 The folder is made of a beautiful combination of black leather and stitched linen with inside transparent windows for visible business card storage and important contact information (e.g. phone numbers of emergency services and car replacement service). The folder has enough storage space, compartments and a pen holder and is a must have for keeping the various board documents tidy such as owner’s manual, service manual, maintenance booklet, warranty booklet, navigation operation manual, troubleshooting information, car papers and registration document. Th storage folder will be shipped exclusively on-board documents. With the addition of this new product the range of vehicle documentation, which is available via the website VDOCS, has been further expanded.